The North Dade Broward County Chapter of The Continental Societies, Inc., in-stalls six new members, Lorrie Showell, Jocelyn Hollis, Mitzi White, Stacey Mahoney, Beverly Carter Remy and Polly Hamilton. The Continental Societies, Inc., a public service organization, dedicated to the social, economic and cultural welfare of underprivileged children and youth. 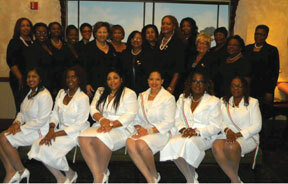 The North Dade-Broward County Chapter was installed as a member chapter of Continental Societies on March 16, 2002. Since our inception, we have been committed to addressing the needs of youth in the national organization’s focus areas and initiatives through partner schools and various youth organizations. North Dade-Broward County Chapter members use their energy and talents from a range of professions including education, juvenile services, information technology, insurance, and finance to implement youth programs and activities. Visit us at www.ndbccontinentals.org.